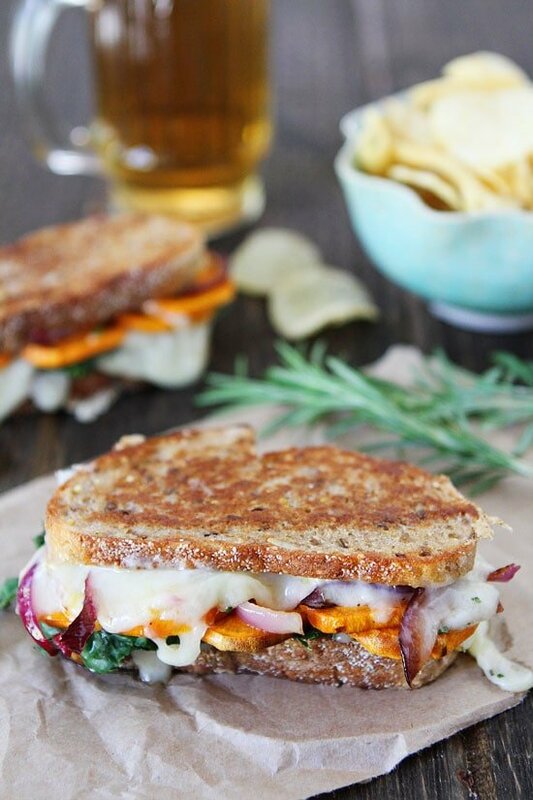 Sweet Potato and Kale Grilled Cheese-this grilled cheese sandwich is layered with sweet potatoes, kale, caramelized red onions, rosemary, and lots of cheese! Oh, and it is cooked in brown butter too! It’s amazing! Our Sweet Potato and Kale Pizza is my favorite fall pizza. I insist we make it once a week during the fall months. Well, the other day I was craving my favorite pizza, but we didn’t have time to make pizza dough, so I turned my favorite pizza into a grilled cheese sandwich. This Sweet Potato and Kale Grilled Cheese reminds me of my favorite fall pizza, but is easier to make and do I dare say it might be better? I have a new favorite fall food! I love eating grilled cheese sandwiches during the fall months because grilled cheese are classic comfort food and go perfectly with a bowl of warm soup! 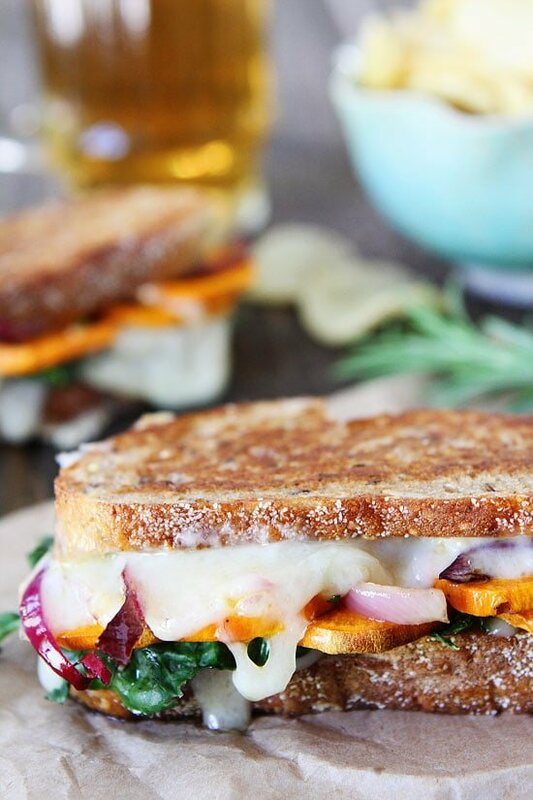 This grilled cheese sandwich has all of the same flavors as my favorite pizza: sweet potatoes, kale, caramelized red onions, rosemary, and cheese. I used Havarti because that is what we had in the fridge, but fontina, mozzarella, brie, or white cheddar would be good too! You can’t go wrong with your cheese choice. I am sharing this grilled cheese sandwich for my good friend Jess’s virtual baby shower today so I had to “trash” it up, Jessica style. If you read Jess’s blog, you know she comes up with the most creative, decadent, and fun recipes. And I hope you have her new cookbook, Seriously Delish. Remember those chocolate peanut butter brownies I made? Yeah, they are from Jess’s book! Best brownies ever! I put my Jessica thinking cap on and decided to cook the grilled cheese in brown butter. The grilled cheese would be fine cooked in regular butter, but the brown butter makes the sandwich extra special…and we are all about extra special since we are celebrating Jess and her bundle of joy! I also added a balsamic glaze to the sandwich because that is something Jess would do! The glaze is optional, but I highly recommend it! It is amazing! We use DeLallo’s Balsamic Glaze. It’s the best! 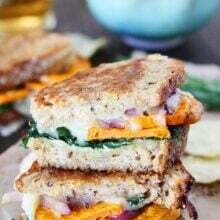 Celebrate Jessica, Eddie, and their baby by making this Sweet Potato and Kale Grilled Cheese Sandwich! 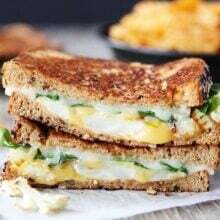 It is loaded with flavor and the ultimate fall grilled cheese! 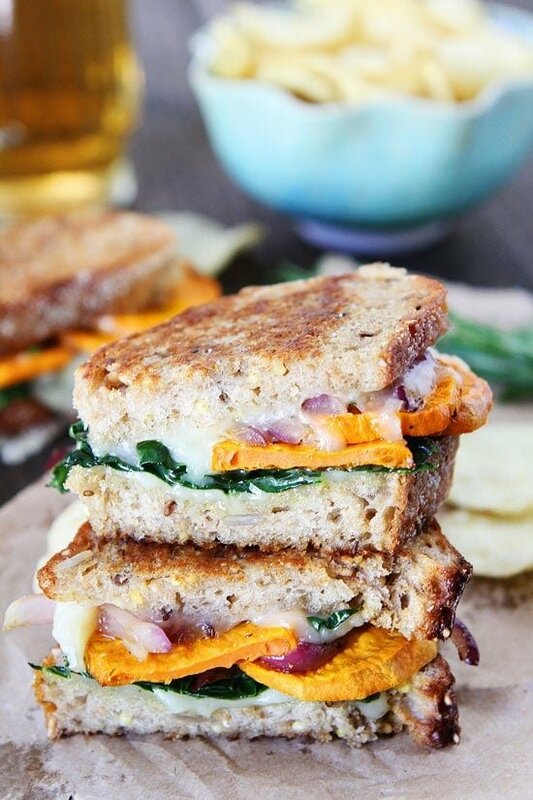 This sweet potato and kale grilled cheese is loaded with flavor and the perfect fall sandwich! Preheat oven to 400 degrees F. Place sweet potato rounds in a small bowl and drizzle with one tablespoon of the olive oil. Toss well. Season with salt and pepper, to taste. Place on a baking sheet and roast for 20-25 minutes or until tender. Remove from oven and set aside. While the sweet potatoes are roasting, caramelize the onion. In a small saucepan, heat the remaining tablespoon of olive oil. Place the onion slices in the pan and cook over medium heat with a pinch of salt. Cook, stirring occasionally, until onions are caramelized, about 8 minutes. Remove onions from pan and set aside. Place the butter in the same small saucepan and melt over medium-low heat. Continue to cook, swirling occasionally, until butter turns golden brown and has a nutty aroma. Pour butter into a small bowl and set aside to cool to room temperature. Heat a large skillet or griddle over medium heat. To make the grilled cheese, butter the outsides of the bread slices with the brown butter. Layer the cheese, sweet potatoes, kale, and caramelized onions. Sprinkle fresh rosemary over the ingredients and season with salt and black pepper, to taste. Drizzle with balsamic glaze, if using. Top with a slice of bread, buttered side up. Place the sandwiches, butter side down, on the hot skillet pan or griddle. Grill for 2-3 minutes or until golden brown. Flip and cook on the other side until golden brown and the cheese has melted, about 2 more minutes. Serve immediately. Omg this looks and sounds so good! 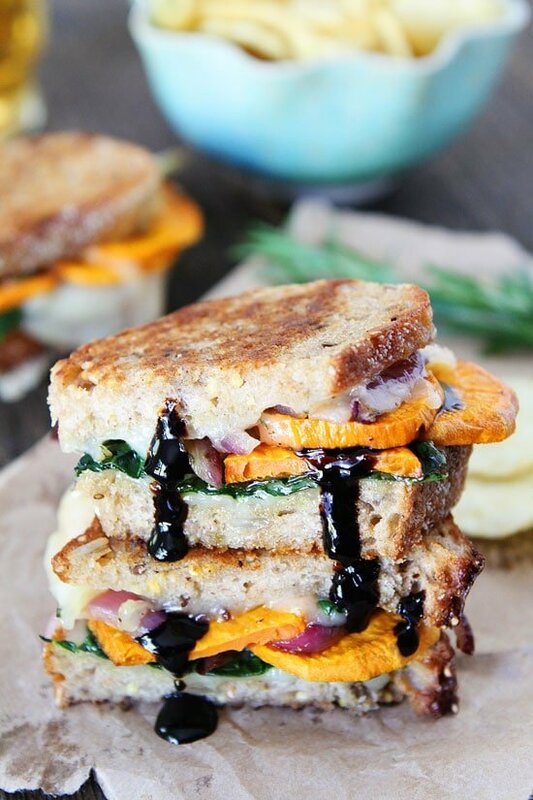 I wish I was having this right now as I sit at my desk and edit…what a perfect sandwich 🙂 And I love the balsamic drizzle, too! pinned! I’m at loss of words how awesome this twist on your standard grilled cheese looks! Looks delicious. 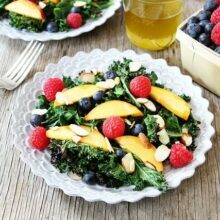 Love the sweet potato and kale combo! Pingback: Orange & Ginger Apple Cider Shandy #howsweetbabyshower | Stylish, Stealthy & Healthy. We just had grilled cheese made with homemade pimento and cheese last night for dinner. It was delicious, but lacked bulk for a “dinner”. This would solve that problem! Ooooo, loving these grilled cheese flavors!! Pingback: Confetti Cupcakes with Cake Batter Frosting for Three! : Best of Baking with Pinterest! my love for you knows no bounds!!! THANK YOU! I had no idea you could caramelize a red onion! Doing it asap! And rosemary is the best herb ever, it just packs the perfect punch. what a perfect fall sandwich!! love all the colors! This is one trashed up grilled cheese…LOVE it!!! What a perfect dish to celebrate Jessica and her little bundle of joy. Congrats Jessica! Well, that changes my lunch plans for tomorrow! I’d never thought about putting sweet potato in sandwiches, but clearly I’ve been missing out! What an awesome sandwich, Maria! 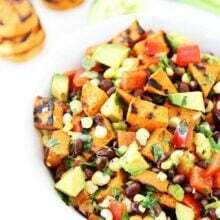 I love the thought of biting into some sweet butternut squash, along with savory cheese. I’ve been craving grilled cheese for days and how can you beat this when it’s cooked in browned butter?! Yum. I knew I’d find something GLORIOUS over here. Thank you so much for being a part! xoxo! 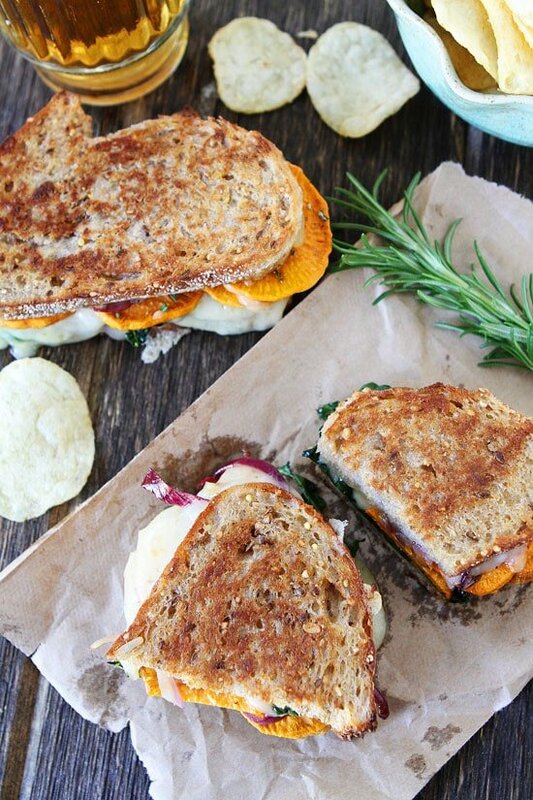 Love a good grilled cheese and sweet potatoes are one of my favorites! Whoa. I think I just found my next MUST try grilled cheese sandwich recipe. That kale. Those sweet potatoes. THE CHEESE! Looks great, Maria! This sandwich rocks. my. world! This is gorgeous!!! I need one asap!!! 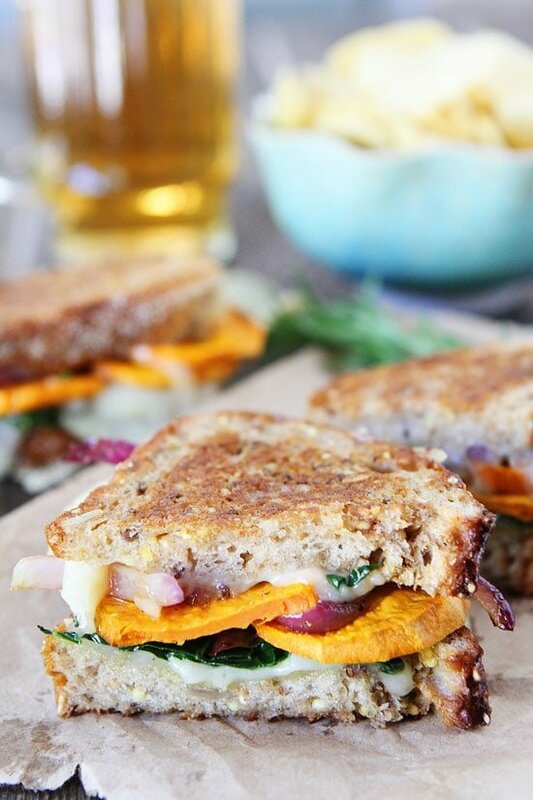 I love the idea of adding sweet potato to a grilled cheese sandwich! Yum yum yum yum yum yum YUM. Yes please, I will take 3. So, basically this sandwich is perfect is what you’re saying? I need this in my life right now! Pinning! such a great combination of flavors! this sounds and looks incredible. Gorgeous colors! This sandwich looks so delicious. Oh god this grilled cheese sandwich looks delicious – never had kale to a grilled cheese before, definitely something I need to try! This looks AMAZING! I need this sandwich in my life! This grilled cheese looks WAY too good. Loooove the sweet potato in their and the brown-butter touch! What a yummy sandwich! Can’t wait to make! Would you consider this clean eating? It looks delishes!! looks yum yum. love the brown butter touch. i know you used whole grain bread, but what specific bread did you use? I bought whole grain bread from the bakery at the store! It was baked fresh! The most delicious grilled cheese ever! Gourmet comfort food. I am vegan, so made it with vegan cheese and butter. Also reduced the oil to 1 tsp for the sweet potatoes and 1 tsp for the onions. Still hit it out of the park! Definitely use the balsamic glaze. I used Trader Joe’s. 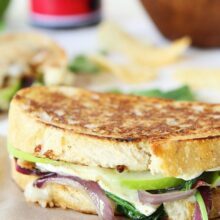 Pingback: 11 Healthy Grilled Cheese Recipes That’ll Satisfy Your Cravings – user's Blog!